The folks at Craft Cadence (https://craftcadence.com/) recently reached out to us to get our thoughts on their Craft Cadence Cycling Backpack. The backpack is designed with the cycling commuter in mind and is rated IPX-5 to withstand most rain, sleet and snow showers that a commuter might encounter. The Cadence backpack came by way of London England, not too shabby. Craft Cadence is still a very new company being founded in 2016. We received version 2.0 of the Cadence Cycling Backpack. Craft Cadence incorporated updates to the backpack based on testing and feedback from their customers. Our Craft Backpack came in a yellow/black combo. The other backpack option was all black. 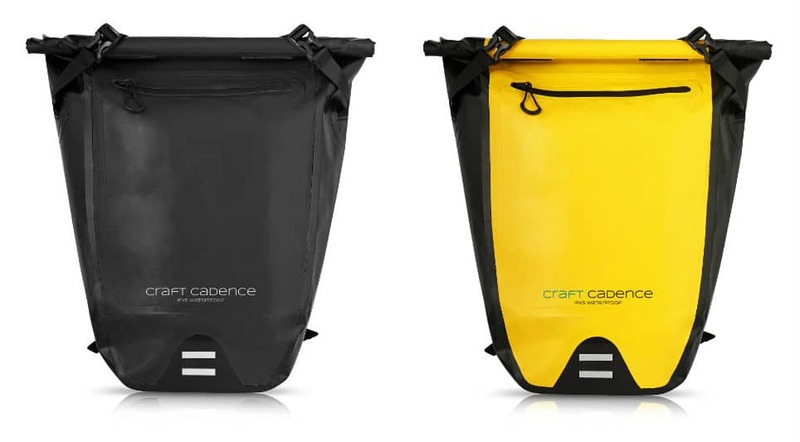 Currently Craft Cadence offers to color options for their cycling backpack including an all black and a yellow/black combo. We opted for the Yellow/black combo for testing feeling it would be a better choice for visibility during day rides. The backpack, when fully extended measures 60 cm (height) x 43 cm (width) x 19 cm (depth) and it’s capacity when full is 30 Liters (or 30 litres for your Brits out there). The older (Version 1 Craft Cadence Backpack) had dimensions at the top of the bag go from 48 cm to 23 cm on the bottom. The new bag is now 43 cm at the op to 25 cm on the bottom. Both the new and old backpacks maintain the 30-liter volume. In testing other backpacks like the Timbuk2 Especial and Missing Workshop Vandal, I find 30 Liters to be a reasonably sized backpack for commuting. It’s one of those things that isn’t too big or too small and just feels right. The Craft Cadence backpack is a roll-top backpack, which happens to be my preferred method for closing commuting packs. The rolltop is secured using two velcro strips and locked in place using two straps. I did find the velcro to be a bit too thin to be secure by itself and felt it could be beefed up and wider. When comparing the velcro to other rolltop backpacks I have used, it seemed a bit inadequate for the job. That said Craft Cadence includes 2 additional straps to secure the rolltop and when used makes it super secure. Below the rolltop is an outside pocket that can store small accessories such as a phone, keys and a wallet. IMPORTANT NOTE: The outside pocket is not IPX5, so if it is raining a lot, you will want to store your electronics and other items that may be damaged if wet in the internal bag. While other backpacks like the Ortlieb Velocity look similar to the Craft Cadence, they lack the outside pocket, which is nice additon to have. The backpack comes with a removable inner section that is attached by velcro along the top edges. The inner section is divided into 3 sections or pockets. Laptop Pocket: The padded laptop pocket allows room for a 15 inch or smaller laptop. Main Compartment: The main compartment is useful for carrying clothes and misc bulkier items. Zippered Pocket: The Zippered pocket is large enough to carry an iPad, tablet or notebook type device. If needed, you can fit water bottles on either side of the removable lining. For those that just want a big area to store things, you can remove the inner divider. I would have liked to see an additional smaller pocket on the outside of the padded portion for storing smaller devices like a phone or keys. The mesh zipper pocket while good for large items, seems a bit big for phones and small items. The backpack comes with a pretty standard shoulder harness setup. It has two retention webbing straps (sternum & waist) that can be tightened or loosened at the buckle. The sternum strap fits firmly over the chest and can be adjusted up or down based on preference. The 2nd hip belt strap fits above the waist to help make the backpack more secure when traveling. To help keep the backpack cooler when wearing, the designers included mesh padded shoulder straps which have air vents to maximize air flow and reduce buildup of moisture. The pads also stick out from the pack providing a vertical channel to help air circulate. Each shoulder harness has 2 reflective webbing loops, perfect for attaching lights or possibly GoPro accessories. When carrying the backpack, you have several options. You can carry it by the shoulder strap, wear it like a traditional backpack or carry it using with the carrying handle. Overall the setup felt good. For £79.99, the Craft Cadence Backpack is a heck of a deal. It ticks all the right boxes, and if you opt for the yellow/black combo, you can feel comfortable in knowing that your backpack will be highly visible day or night. Check out Craft Cadence (https://craftcadence.com/) website and also check out their blog (https://craftcadence.com/blog) for some helpful commuter tips.
) for some helpful commuter tips. Thank you for sharing this review! Looking forward to trying this out. Great aesthetic on these packs!